A mysterious triangular object having one light at each corner has been identified as a TR-3B. It was filmed flying slowly over Russia in what UFO conspiracy theorists claim the best evidence of space aliens ever recorded. The footage shows a shape flying across the skies. It was posted on the dark web and has been circulated among underground UFO groups. 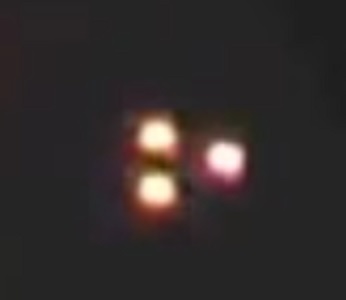 The video was also recently shared on YouTube, which shows an object with three lights moving very slowly through the air and almost floating in the sky. Many UFO enthusiasts believe that it is physically impossible for any known aircraft to move at such slow speeds. The aircraft has been described as a black triangle, or a TR-3B, a class of UFO that has been observed during the 20th and 21st centuries. These objects have been linked to a rumoured US Air Force Aurora aircraft development program. Most reports of black triangles come from Britain and the United States, but they are increasingly being reported in other parts of the world. Reports describe this UFO class as large, silent, black triangular objects floating or slowly moving at low altitudes above cities and highways. Sightings of the object usually take place at night, and they are often described as having pulsing, coloured lights visible at each corner of the triangle.